My boys spent much of the day reading and playing, and have finally succumbed to the lure of the computer. My husband took the day off from work and is sitting across from me, half-asleep on the back porch swing, the late summer breeze lulling him. Our two dogs, Tam and Jimmy, are hiding in the cool shade beneath the porch. Every once in a while they shift and I can here the rustle of dead leaves. I’m happily tired, sipping a creamy cup of coffee and covered in flour. Good times. I spent the morning baking. 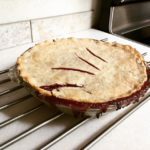 A plum pie sits cooling on the rack in the kitchen. It’s an experiment: there are still ten pounds of last summer’s plums in the freezer, and I need to make room for this year’s quickly-ripening crop. I can see our one plum tree ripening quickly, and know our neighbor’s orchard is heavy with fruit. It’s time to get creative! Last year, we had visions of canning jams and compotes galore. But the reality of dealing with over three gallons of plums, so ripe they burst when you looked at them, during a record-breaking heat wave, was overwhelming. A failed jam experiment (but truly delicious sauce for ice cream!) brought out our pragmatism. We washed the remaining fruit and froze it for future use. Over the year I made a few plumbles (plum + crumble = plumble) but barely made a dent in our freezer stash. After all, what do you do with plums? In my mind, plums are to be eaten fresh. They are never better than eaten directly off the tree. For some reason, I couldn’t get past this mentality. Yesterday, the solution occurred to me. Pie! I removed two bags (about five pounds) of plums from the freezer. We set them out on a cookie sheet to thaw, and made a few futile attempts to pit them before throwing our hands up and the plums into a large saucepan. After about three hours over medium-low heat (and one spectacular boil over, courtesy of not carefully observing the medium-low heat suggestion), the flesh was falling off the pit. We made quick work of removing the pits, then returned the plums to the stove to cook down. After another hour or so, the liquid was greatly reduced. I let it cool, then slid it into the refrigerator. Operation Plum Pie to be continued in the morning. This morning, after a quick trip to the grocery store for Crisco, the pie making began. I’d share my mom’s secret pie crust recipe, but you could just look on the back of the Crisco container and find it there. As for the plums, it’s ridiculous how sour they were! They were sinfully sweet fresh off the tree. They required a staggering amount of sugar to make a palatable pie filling. I’m a pretty good baker, but my baked goods don’t tend to be pretty. This might be one of the best looking pies I’ve ever made. If it tastes even half as good as it looks and smells, I’ll consider myself plum lucky! Cook plums over medium-low heat until fruit separates from pit. Remove all pits. Continue cooking until plums have thickened. Remove from heat and allow to cool, preferably overnight in the refrigerator. Preheat oven to 450 degrees F. Remove fruit from refrigerator. Once cooled, mix in sugar, cornstarch, cinnamon, and cloves. Combine well. Line pie plate with bottom crust. Pour in fruit mixture. Top with remaining crust. Seal edges of pie with your fingers or a fork. Cut several vents in the top crust. Place pie plate on cookie sheet and slide into preheated oven. Bake at 450 for 10 minutes. Lower oven temperature to 375 and continue cooking, 50-60 minutes. Remove when crust is golden and fruit is bubbling. Allow to cool. Delicious served with a scoop of vanilla ice cream!